WHERE: CNBC’s “Squawk on the Street” – Live from the Yale CEO Caucus in Washington D.C.
SARA EISEN: Stocks are a bit lower this morning, ahead of today’s Federal Reserve decision on interest rates and the policy statement. The major indices though are up double digits since Chairman Powell said, back in January, that the Fed will take a patient approach to monetary policy. 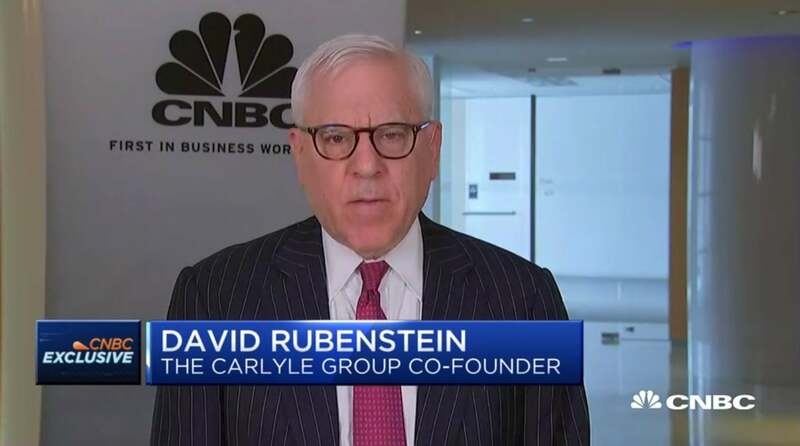 Joining us now for a CNBC exclusive is Carlyle Group Co-Founder and Co-Executive Chairman David Mark Rubenstein, live today from the Yale CEO Caucus down in D.C. David, welcome. Nice to see you again. DAVID MARK RUBENSTEIN: My pleasure to be here. DAVID MARK RUBENSTEIN: Well, he’s obviously a person that’s got a lot of people focusing on him. He worked at Carlyle for about eight years – he was an outstanding buyout professional. I thought that was the highest calling of mankind, he would stay there forever, but he decided that public service was more important, so he’s now doing a great job, I think, as Chairman of the Fed. Now that’s a difficult position because nobody ever likes anybody who is increasing interest rates, so when he’s had to increase interest rates, that’s been a problem for some people. But I think it’s been the right decision. SARA EISEN: Do you expect that he’s done increasing interest rates this year? DAVID MARK RUBENSTEIN: Well, nobody knows for certain. He said that he depends on and the Fed depends on the economic situation and the statistics. So, it depends on what the facts show. But right now, based on what he sees, it appears, though I can’t really speak for him, it appears that he feels that there’s a justification for a pause for a while, and I would expect that probably you wouldn’t see in increase in interest rates any time in the near future. SARA EISEN: I wanted to get your side. I mean, you’ve got a pretty good window into all sorts of businesses at Carlyle. DAVID MARK RUBENSTEIN: Okay. We own about 200 companies, partial stakes or full stakes around the world, so it gives us a good insight. Essentially, I would say that the economy around the United States is in reasonably good shape. We don’t see any signs of a recession. We’ve gone about ten years without a recession. That’s very unusual, but we don’t see any signs of it in all the data we have at our companies. Europe is obviously slowing down. I think Brexit is a big problem for Europe. And France and Italy have some other challenges as well. So I’m not as bullish on Europe at the moment. Though I think prices are relatively low and probably a good place to invest. Asia has slow downed a little bit, but I don’t think it’s actually going further south from where it is. I think China will probably pick up once the trade agreement is announced and I do think there will be a trade agreement with China in the not too distance future. DAVID MARK RUBENSTEIN: Well, of course, things can always go wrong, but the signs that have come out of both sides are that there’s some indication that there will probably be a meeting with the President and Xi Jinping at some point in the not too distant future, at which point they will probably reach an agreement that’s publicly announced. Obviously, there are difficult issues to be resolved. I think enforcement is one of the most important issues that has to be resolved. If they reach an agreement, they have to figure out how to enforce it. But I do think there’s a sense on both sides it would be good for both sides to get an agreement. And I think if there is an agreement in the not too distant future, I think that will pick up the Chinese economy and I think it will be bullish for the U.S. economy as well. CARL QUINTANILLA: So if we get -- if we get resolution there, we’ve already talked a bit about stimulus in areas like China, does the slowdown X - U.S., does your experience show you that we run the risk of having that wash on our shores? DAVID MARK RUBENSTEIN: Well, the United States has recessions every seven years or so, historically since Ward War Two. But we’ve been ten years since then. I don’t know if we’ve repealed the business cycle but elongated it, such that we may be going a couple more years before there’s a real slowdown or so-called recession. China doesn’t seem to be having a recession, they haven’t really had one for a quarter century or more, though they have slower growth than they had before. I do think that the news of a U.S./China agreement will be bullish for the U.S. and Chinese economy. And I think it will probably help the European economy as well. DAVID MARK RUBENSTEIN: Well, the markets tend to be forward indicators, and they tend to anticipate things. I think the market has anticipated there will be an agreement in the not too distance future and therefore it may be, to some extent, already built into the market there. There may be a little push upward but I don’t think the news will of it will push the market up so much as I think make people feel in the economy that generally things are better than they were before. SARA EISEN: You briefly touched on valuations and you said you saw some opportunity in Europe. Can you talk a little bit more about where you’re seeing deal-making activity and potential? DAVID MARK RUBENSTEIN: Sure. Well, to begin with, the United States is still the best place to do Private Equity deals in the world. It’s the biggest market and it has the best financing, the best executives, the best exit opportunities. Europe is very attractive as well because prices are about 20% lower for comparable assets in Europe than they are in the United States, and there’s some uncertainty in Europe and that tends to produce a lower price and financing is pretty much readily available. Asia is also attractive as well. While it’s slower growth now, I think prices have come down a bit from the peak and, therefore, I think there are good buying opportunities in Asia. I think Latin America is really coming back. Brazil is now much more attractive than it was a year or two ago. I think even in Africa we see some very attractive opportunities now as well. CARL QUINTANILLA: Speaking of opportunities, David, it’s going to be a big week, maybe a big few months for Initial Public Offerings as we get some exits of investments that have been in the works for a long time. I just wonder of the buckets that are coming to market that have to do with structural growth, autonomy, mobility, cloud, which areas are of particular interest to you in Carlyle? DAVID MARK RUBENSTEIN: Well, we’ve made investments in a number of say growth companies, ones that are part of the newer economy. We are not an investor in say Uber or Lyft which are going to go public presumably in the not too distant future or Airbnb. Those are good investments, I think, for the people that went in early. I wish I had been an early investor in them but I chose not to do so. And I made a mistake perhaps. DAVID MARK RUBENSTEIN: Well, I -- you know, I’ve generally not been an investor in those type of companies. Carlyle has typically been more of a buyout investor. We haven’t been a venture investor typically so we really didn’t pursue those opportunities when they were available to people in the early stages of the company. But as I’ve said before, I missed Facebook at the beginning. I kind of missed Amazon at the beginning. So I’m pretty good at missing really good technology companies at the beginning. I just don’t anticipate them as well as I should. So I just don’t know. You can’t make or win them all. DAVID MARK RUBENSTEIN: Well, we have political risk all the time in the United States because you never know where the government is going to go, majority Republican, majority Democratic. Right now, I think generally people are prepared for a one-year long march towards an election, and I suspect that there will be ups and downs. I don’t think anybody really knows who is going to be the next President of the United States. I think many people believe that President Trump might get re-elected because the economy is in reasonably good shape and the Democrats have not yet emerged with a leader but it’s too early to predict. If you go back a year and a half before each of the last ten presidential elections and predict who is likely to be President a year and a half in advance, you’d be wrong every time. So, it’s really a fool’s errand to try and predict right now. It’s fun probably not realistic as to who will be President. I think the business community really believes the economy’s in pretty good shape, and therefore, as a result, I think the business community is not as worried about these issues as maybe others are. SARA EISEN: But you’ve got to be listening to the dialogue right now. I mean, what’s your sense of the sort of populist left turn that we’re getting out of some of the democratic hopefuls? DAVID MARK RUBENSTEIN: Well, of course, it’s too early to know whether they’re going to capture much of the vote. They might capture a lot of the attention. We don’t know whether they’ll capture a lot of the vote. But clearly, it is making some people in the democratic party worried that the nominee could be too far to the left or the party could get driven to have the left and that might make it difficult to win the general election. Generally, people far to the left or far to the right don’t usually win general elections, but we’ll see what happens now. Clearly, if Vice President Biden gets in the race, as it looks like he will, he’ll bring a moderate voice to the democratic party and that might make the party move back a bit more to the middle. CARL QUINTANILLA: Another question, David. You know, we know you’re a student, a lifelong student of American political history, going back to the beginnings of the Republic. I mean, when you start hearing things like, ‘Do we do away with the electoral college? Do we add seats to the Supreme Court?,’ is that -- is that just part of the political silly season, the early primary season, or do you think the fundamental rules of our democracy are seriously being questioned? DAVID MARK RUBENSTEIN: Well, remember, the electoral college was put in at the Constitution’s Convention – the Constitutional Convention and it’s not likely to be changed, because it takes a – both houses of Congress -- two-thirds of both houses of Congress and three quarters of each of the states to make a constitutional amendment. So it would be unlikely you’ll get that kind of support. Three quarters of the states would have to vote for a constitutional amendment to abolish the electoral college. So, it’s fun to talk about. When I worked on Capitol Hill for Senator Bayh, who recently passed away, he was a big advocate of direct elections, and direct elections would have given us different results in several recent presidential elections. But we have to talk about what’s realistic. The electoral college is not going to be changed because so many states that are smaller really like the electoral college. SARA EISEN: I mean the other issue that we talk a lot about here and gets a lot of buzz on Wall Street is this idea of the War on Wealthy, and the fact that you have this freshman firebrand representative, AOC and others, proposing extreme taxes on the wealth. Do you think that’s a positive debate we should be having or are you worried about it? DAVID MARK RUBENSTEIN: I’m never against a debate. I think everybody should be debated, to be realistic about it. People who are on the Ways and Means Committee in the House of Representatives are not talking about some of these things. It’s the Ways and Means Committee that really develops tax legislation, ultimately has to go to the full House and then the Senate Finance Committee in the Senate. I don’t see members of those committees talking about these things in a serious way. So, there’s always easy to talk about these kind of changes and they should be looked at, but I don’t think it’s likely to happen in the near future. DAVID MARK RUBENSTEIN: Yes. I interviewed him recently, and he made it very clear that he had thought he might be moving to New York, but now he looks like he’s not, because he was upset about the Amazon situation in New York. So, I think that probably did have reverberations that were not anticipated at the time. And I wonder whether some of the people who were against Amazon would now -- if they had a chance to re-look at what they said, but I don’t know for sure. But I do think it’s an unfortunate situation for New Yorkers. I think it would have been good for New York. SARA EISEN: David Mark Rubenstein, good to catch up with you. Thank you. DAVID MARK RUBENSTEIN: My pleasure.